This is the perfect Thanksgiving look! I love that pretty plaid mixed with the moto. SO good!! Hope you had a great holiday! Thanks Shauna! I did! Hope you did as well. What an incredible jacket for such a fabulous price. I always thought I was a deal finder, but you got me beat on this one!! Thanks Jodie! I definitely shop around for the best price! Oh that is such a pretty jacket! I love the burgundy and have been wanting one in that color. Such a classy looking jacket and for an amazing price. Love the wine colour, so unusual in this type of jacket. A real statement piece. Love that colour with grey and the silver jewellery. And we have practically identical scarves, what a small world we live in !! Hope you had a fantastic thanksgiving, hugs, x. Thank you! I'll have to keep an eye out for your scarf and see if you post a picture! 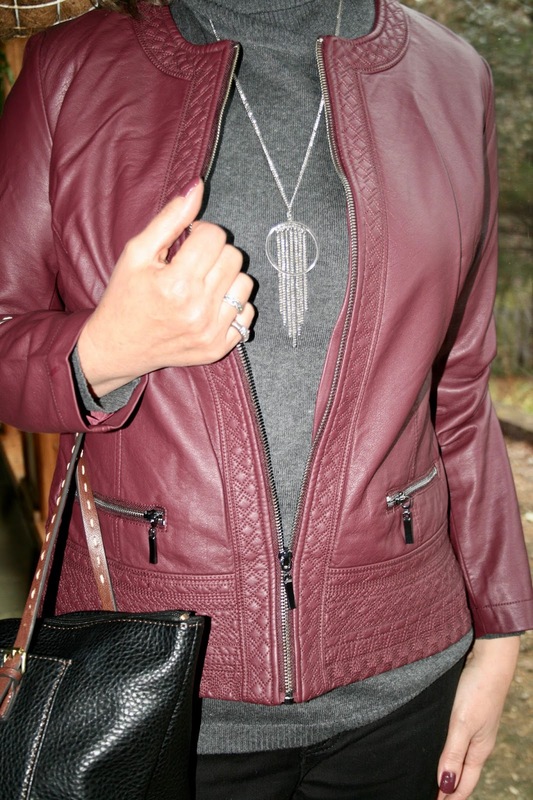 Such a cute moto jacket! I love the cranberry shade and that scarf is perfect with it! You look so warm and cozy! Love the jacket! Thanks Laura! I was very warm and cozy! What a great look Amy! Pretty jacket Amy! Love the detail around the collar and of course, the burgundy shade. It looks wonderful with your scarf and what a deal! Lovely jacket and scarf! Thanks for linking up! You look so good in burgundy! I absolutely love the way your jacket looks with the blanket scarf (which btw looks super comfy). This is definitely an outfit that I would wear this season. Thank you for linking up this week! Thanks Sheree, it is a super comfy scarf. A little less bulky than most blanket scarves. 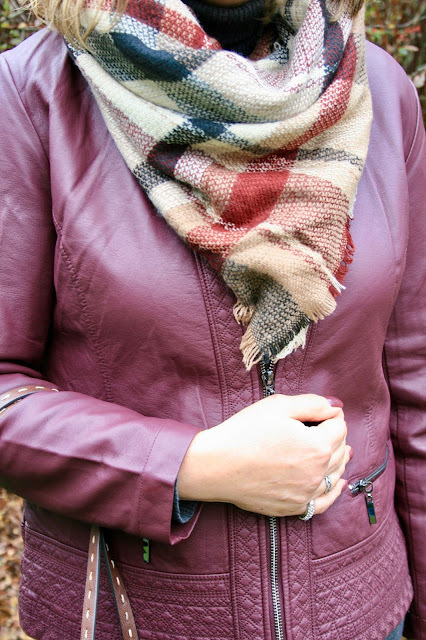 Love the plaid scarf and burgundy leather combo, great combination of two different pieces for a really chic look! That burgundy jacket is beautiful and I love how you styled it! !